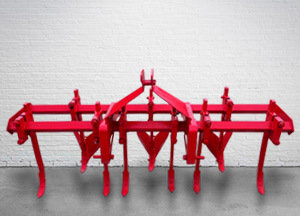 Multi purpose (multi crops) inters row cultivator ridger without fertilizer attachment. Suitable for cotton, sugar cane, maize & potato crops. Power Source 60-70 HP Tractors. No. of Tines 9 Nos.